Sometimes a piece of art jargon gets stuck in your head. This happened to me recently after I noticed the word ‘liminal’ in several exhibition titles and saw a number of thematic shows that, even without a stated reference, addressed the subject of ‘liminality,’ a term that was originally used by anthropologists in the early 20th century to refer to the transition point of a rite or ritual. Over the last decade, artists and curators have employed the term in various ways to describe art that involves what happens in the space between two entities, identities or phenomena. Most often the focus is on thresholds, transitions and states of flux. A Google search of ‘liminal art’ tells us that in the past fifteen years there have been exhibitions with such titles as “Liminal Space,” “Liminal Places,” “Liminal Air,” “Liminal Drift,” “Liminal Artifacts” and “Awareness of the Liminal,” just to name a few. The popularity of the term is, in fact, a widespread aesthetic phenomenon, as exhibitions of liminal art have not only been popping up in numerous cities around the U.S., but have also occurred around the globe. In perusing documentation from several of these exhibitions, it becomes evident that interpretations of ‘liminality’ are malleable and still expanding. Within today’s art arena, the term can refer to something that occurs within an artwork as well as to how a viewer interacts with the space in front of or surrounding it. Although often associated with spirituality and consciousness, ‘liminality’ is also frequently applied to issues of identity and immigration, as in when a person is binational and torn between allegiances, or is fleeing one’s homeland for a better life. “Dialectic of Being & Becoming: Realization of Fullness,” curated by Khang Bao Nguyen for Highways Performance Space, included works by fourteen visual artists and nine performance artists. The exhibition’s premise was to examine art concerning two paths to self-realization, one involving linear progression with eyes on the future, and the other utilizing the Zen approach of being “in the moment.” The third exhibition, curated by Ichiro Irie at JAUS, was titled “Liminimal.” This art-about-art project presented paintings by three artists whose formal vocabularies derive from Minimalism, but whose work also embodies forms of expression that run counter to Minimalism’s emphasis on nothing other than the object itself. Perhaps because they were intended to be broad surveys, “Transiting” and “Dialectic of Being and Becoming” were not as cohesive or consistent in quality as “Liminimal.” Among the more notable works from the three exhibitions are a very moving installation by Meital Yaniv, intriguing drawings by Colin Roberts, and radiantly luminous paintings by Shingo Francis. 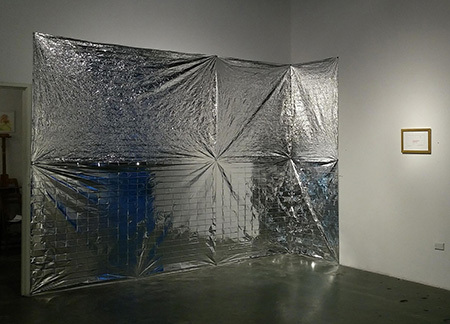 In “Transiting,” Yaniv responded to the tragic plight of immigrant children separated from their parents by simulating a brick wall using shiny Mylar space blankets, the kind being employed at government detention centers. To either side of the wall, the artist drew a child’s height mark corresponding to the average height of a five-year-old and, to the right, installed an official return envelope for U.S. citizenship and immigration services, framed in gold. In terms of liminality, the wall and what it represents — the situation of immigrants when they reach the border — are both threshold points in what is a dangerous and as yet unresolved journey. In a broader context, the installation also alludes to what may ultimately be remembered as one of the political tipping points of Trumpism, the separation of families at the Mexican border. In “Liminimal,” Francis’ “Interference” paintings employ a simple, minimal geometric vocabulary of a square within a square or a rectangle within a rectangle. Created with interference oil paint, which is iridescent and thus changes color as it responds to light, Francis’s paintings entice us to move about the space to experience an ephemeral sensation that maintains a constant state of flux.